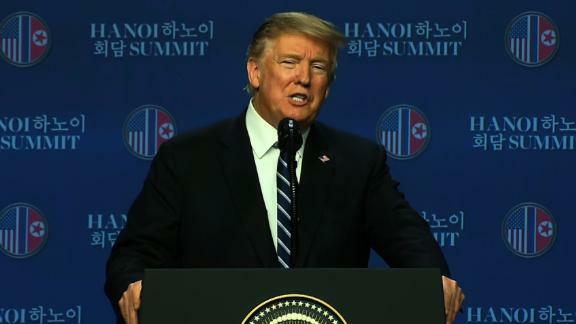 President Trump speaks to reporters in Hanoi, Vietnam, after the White House said no agreement was reached between Trump and North Korean leader Kim Jong Un, saying sanctions were a key sticking point in their negotiations. President Donald Trump arrived in Hanoi eager to demonstrate progress in his high-wire diplomacy with North Korean leader Kim Jong Un, confident that his personal touch could bring Kim closer to abandoning his nuclear weapons. Though US officials did not expect the second Trump-Kim summit would deliver a breakthrough, the White House was confident enough that the two leaders would sign a joint declaration advancing the negotiations to include it on the President's public schedule. Instead, the summit ended more than an hour early, with the signing ceremony and a planned working lunch, scrapped. Kim had demanded total sanctions relief upfront in exchange for only partial denuclearization, leaving the two sides at an impasse. Trump cast his decision to walk away as evidence that he will not accept a bad deal, but the abrupt conclusion of his much-ballyhooed second summit nonetheless amounted to the most stinging setback yet in his effort to achieve North Korea's denuclearization through direct talks with its leader. And it raises broader questions about the fate of Trump's high-stakes effort. More than anything, the failure to produce results during the second summit called into question the personality-driven diplomacy that has been at the core of Trump's effort to end the North Korean nuclear threat. Rather than engage North Korea in lower-level talks that would progressively involve higher-ranking officials, Trump opted to engage Kim directly from the outset, leading to the first-ever meeting between a sitting US president and North Korean leader. It's a break-the-mold approach that senior Trump administration officials have repeatedly cast as central to their strategy, and it was on Trump's lips as he sat down with Kim again in Hanoi. Ahead of the summit, Trump repeatedly cast that leader-to-leader connection as central to their prospects for success, describing his correspondence with Kim as 'love letters' and frequently lavishing Kim with unprompted accolades. In that effort, Trump elevated Kim on equal footing with a US president and tantalized Kim with the prospect of an economic transformation of his heavily sanctioned country. But -- at least as of their second summit -- Trump's efforts to build a personal rapport with Kim was not enough to overcome the impasse between the two sides over the pace of denuclearization and sanctions relief, putting the limits of that personal chemistry into sharp relief. Despite the setback, Trump offered no indication that he was recalibrating his approach. While he said he had not committed to a third summit, Trump continued to tout the strength of their relationship during his post-summit news conference and he nonetheless cast their leader-to-leader discussions as productive and worthwhile. He took pains to avoid disrupting his relationship with Kim, making clear he still sees it as a critical building block to reaching a deal. The US President once again glossed over Kim's position overseeing one of the most repressive regimes in the world, washing Kim of responsibility in the death of the American Otto Warmbier. He took Kim 'at his word' he did not know about Warmbier's treatment until it was too late -- just as he has accepted the Saudi Crown Prince Mohammad bin Salman's denial of involvement in the murder of the journalist Jamal Khashoggi and Vladimir Putin's claim Russia didn't meddle with the 2016 US presidential election. 'I want to keep the relationship, and we will keep the relationship,' Trump said of Kim at one point. Willing to walk away -- but should he have walked in at all? After months of concerns within and around his administration that he was over-eager to clinch a deal with Kim and that he would offer too many concessions, Trump demonstrated that he was willing to walk away from a bad deal. It was an effective way to frame a summit that failed to produce any concrete progress, but it did serve to demonstrate to Kim that as eager as Trump may be to reach a deal, he will not accept one that frontloads the benefits to North Korea and leaves a question mark over the fate of full denuclearization. Yet the failure to reach an agreement raises the question of whether Trump should have joined Kim for a second summit so soon at all. US and North Korean officials had been hammering out a joint declaration for the two leaders to ink in Hanoi for weeks, and Thursday's impasse suggested that the document was not fully baked or sufficient in scope to merit a second meeting between the two leaders. Even as Trump drew a line in the sand on question of providing sanctions relief before denuclearization, he gave himself some wiggle room on where he might ultimately land. Asked during his news conference whether he would insist on full, verified denuclearization before North Korea could enjoy sanctions relief, Trump demurred. The comments suggested that while Trump is not siding with North Korea's 'step-by-step' phased approach to corresponding denuclearization and sanctions relief maneuvers, he is willing to negotiate on the pace of sanctions relief if he deems North Korea is prepared to undertake significant steps to denuclearize.